Duncan F. Kenner (1813-1887) built Ashland for his wife, Anne Guillemine Nanine Bringier, a member of an old and influential French family of Louisiana. Ashland-Belle Helene is representative of the massiveness, simplicity, and dignity which are generally held to epitomize the Classical Revival style of architecture. Free of service attachments and with a loggia on all four facades, it is a more complete classical statement than the vast majority of Louisiana plantation houses. With its broad spread of eight giant pillars across each facade and its heavy entablature, Ashland-Belle Helene is among the grandest and largest plantation houses ever built in the state. Ashland-Belle Helene is also important for its association with Duncan F. Kenner, a sugar planter, horse breeder, lawyer and political figure during the antebellum period. The walls of Ashland (as the Kenner plantation was then known) were adorned with paintings of horses, and the grounds included a racetrack. Kenner himself was a keen advocate of scientific methods of farming and experimented with innovations in the sugar production industry. Kenner is said to have been the first in the state to use the portable railroad to carry cane from fields to mill. In addition to serving in the Louisiana House of Representatives, and as a member of the Confederate Congress, Kenner was appointed in 1865 as minister plenipotentiary by President of the Confederacy, Jefferson Davis, to gain the support of England and France for the Confederacy. When Kenner returned to Ashland at the end of the Civil War, he found his plantation in ruins and his slaves freed, the place having been raided by Union troops in 1862. At the age of 52 he had to start over again, but by persistence and great business skill, and by re-employing as laborers the slaves that had been freed, he built up an estate. When Duncan Kenner died, his plantation was even larger and more valuable than it had been before the war. In 1889, Ashland was purchased by John B. Reuss, a German immigrant who became a prosperous sugar planter. Reuss re-named the plantation "Belle Helene" in honor of his granddaughter, Helene Reuss. 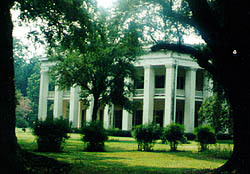 Ashland Plantation is set approximately 1500 ft. from the Mississippi River, just off State Hwy. 75, north of Darrow. Ashland is not open to the public.